Chef Anne-Sophie Pic’s solid culinary pedigree - she is the heiress of four generations of master cooks - has no doubt laid the foundation for her stellar success, which has seen her become only the fourth female chef to be awarded three Michelin stars. Now, in a bid to pay tribute to her family heritage, Pic has put tradition back on the table with the launch of André, a homey restaurant that puts innovation aside and pays tribute to the beloved grandfather who put the family restaurant, Maison Pic, on the map by winning three Michelin stars in 1934. Inspired by the Pic’s legacy, architect Caroline Lory assembled an inviting, casual interior. 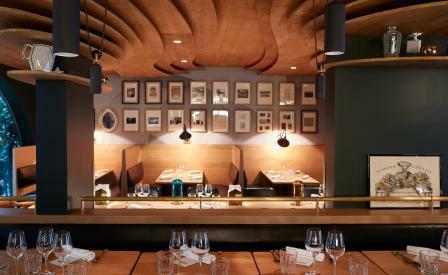 A stepped timber ceiling lends visual impact while creating a sense of intimacy, which is further underlined by cosy booths, which sit under considered pendant lighting. Framed photographs of the family, that line the walls, meanwhile, bring to mind a long-standing generational dining room. On the menu, classics from the family’s gilded cookbook fill the pages, including a crayfish bisque, which is a subtle nod to André Pic, who loved to cook fish, in particular, a crayfish gratin dish, for which he was best known.